Concert Update: This Thursday, May 24th at 7:00 p.m., both the MHS Jazz Band and Concert Band will present their Spring Concerts in the high school auditorium. The Concert Band had been originally scheduled to perform on June 5th. It should be a great night of music! 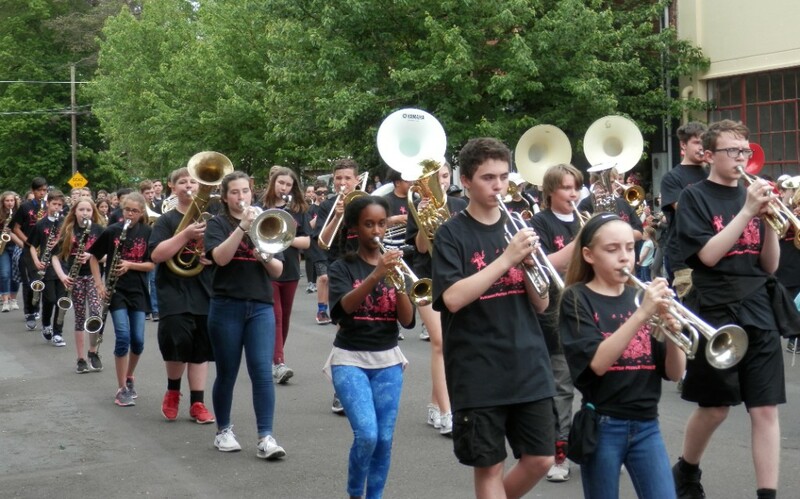 I hope you had a chance to see and hear the bands at the Alien Day Parade. The Patton-Duniway Band (pictured above) and the High School Band (pictured below) marched separately and each sounded fantastic! You can see a few pictures on the Mac Band website and if you have pictures you’d like to share, you can upload them there as well. There will be a couple more opportunities to hear the Mac Parade Band this summer. At Carlton Fun Days on Saturday, June 23rd and the Lincoln City 4th of July Celebration on Wednesday, July 4th. We are nearly at the end of May and also the Rutherford Challenge. Mr. Rutherford challenged us to raise $15,000 for the band and he will match anything we raise up to that amount. Thanks to our very generous community, our total raised now stands at $13,390! Please share this with anyone who may be interested in helping us meet the goal.